This payment module provides everything a Zen Cart store owner needs to accept credit/debit card payments over the internet. 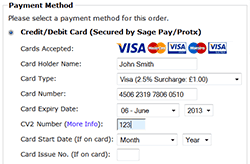 It uses the Sage Pay Direct service (formerly known as Protx Direct), which connects to a bank and checks the validity of the card details entered by the customer at the checkout. The customer remains on the store's website, they are not redirected to an external site to enter their details as with many other payment solutions, making this as professional a payment solution you could possibly use with Zen Cart! The whole checkout process is completely streamlined, therefore allowing store owners to have a store which works just as well as any of the large e-commerce websites! This payment module provides everything a Zen Cart (1.3/1.5) store owner needs to accept credit/debit card payments over the internet. The customer remains on the store's website, they are not redirected to an external site to enter their details as with many other payment solutions, making this as professional a payment solution you could possibly use with Zen Cart! Accept Card Payments quickly and easily! Accept Credit/Debit Cards Quickly and Cost-Effectively! Sage Pay offers one of the most cost-effective solutions for accepting Credit Cards and Debit Cards for UK/Ireland stores. Stores wishing to accept cards online through Sage Pay only need to sign up for a Sage Pay Go account and to link it with a merchant account. (If the store doesn't yet have a merchant account, Sage Pay can provide a good deal with their partners, Bank of Scotland!). Ceon Sage Pay Direct, is the best solution, as the customer remains on the store's website; they are not redirected to an external site to enter their details as with many other payment solutions, making this as professional a payment solution as you could possibly use with Zen Cart! The whole checkout process is completely streamlined, allowing store owners to have a store which works just as well as any of the large e-commerce websites - including full 3D-Secure support using slick IFrame technology. Manage transactions directly within Zen Cart! Deferred transactions can be partially or fully Released or Aborted. Authenticated transactions can be partially or fully Authorised, or Cancelled. Orders which used “Immediate Charge” or “Deferred” can be Refunded in full or in part, or, if not yet settled, Voided. (At this time, Authenticated transactions can only be refunded through My Sage Pay). With all of the transaction actions, the Zen Cart totals for the order can be automatically updated, as can the overall Zen Cart order status - a level of integration never before seen in Zen Cart! Display of “The 3rd Man” fraud results for transactions. Display of the up-to-the-moment status of transactions. Automatic syncing of information about any transaction actions that have been performed against the initial transaction.